Everest strongly believes in giving back to the community and contributing towards social development. Everest particularly endeavours in the well being of the communities in the surroundings of its areas of operations. Everest has established a not-for-profit organization named Everest Foundation to carry out its CSR initiatives with greater focus. Everest Foundation is committed to enhancing livelihood and living conditions of communities. Engage with communities for improving living conditions - Health & Sanitation Education & Sports. To build skill sets across our intended target groups - adolescents, women, and marginalized construction workers among others - the Everest Foundation initiated skills training in computers, sewing and roof installation across various locations in order to directly benefit more than 2000 people. In association with CIDC and Sattva, Everest Foundation inducted and trained 747 marginal construction workers through Roof Master Training Program in last 2 years. Public Healthcare in India is still in a state of flux. Rural areas continue to look for effective ways to make healthcare facilities available to vulnerable populations. To that end between 2015-17 we initiated a Tobacco Control Program, and a public sanitation program as well as individual sanitation program. The foundation has also organised several blood donation camps. Conducted tobacco use and sensitization training for 7,000 participants. Reached 1,000 people directly through health camps. More than 85 percent of school children in India have no access to sports due to a lack of adequate facilities. Less than 10 percent of the population under 35 years of age has access to organized sports. An equally small percentage of youth have access to playgrounds. 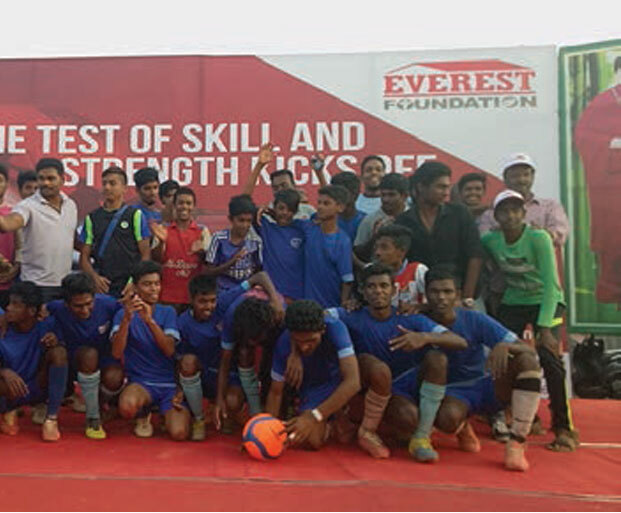 The Everest Foundation seeks to provide a platform for rural youth and children where they can demonstrate their sporting capabilities, and acquire skills that can help them live a healthy and progressive life. To facilitate this, we organize various local and community-level sporting events and training programs at our plant locations. Everest believes in maintaining green and sustainable environments and mitigating environmental challenges. To that end, we pursue the practice of planting saplings in various areas across our sites and the lands allocated by the Forest Department. Various activities have been organized to plant thousands of trees. EVEREST FOUNDATION has organised multiple programs to address the main issues pertaining to the environment. Every member of the Everest team is motivated, skilled, and adds to the strength of the company. Their large-heartedness allows them to willingly share their time and talent with others to build a better, stronger, and safer community. Everest Foundation creates employee engagement opportunities for the workforce of EVEREST FOUNDATION, its primary funding partner. We have created a system under which each employee contributes 1 man-hour in each quarter and 4 man hours in a year for community-driven initiatives. Around 800 employees contribute more than 3000 hours for community projects including sensitization drives, skill-center visits, sports activities, education projects and a lot more.